Nestled in Seguin’s downtown historic district, the Olivia Mansion is a beautiful Victorian mansion that offers elegant bed and breakfast accommodations. One of the area’s first homes to have electricity, the stately home features stylishly appointed and individually decorated guest rooms with antique furnishings, four poster beds, original artisan crafted fireplaces, and bathrooms with luxurious whirlpool tubs. Deluxe suites have separate lounges and modern conveniences, and a gourmet breakfast is served in the grand dining room or on the porch every morning. The mansion has several elegant lounges with fireplaces and plush seating, and a stunning garden with a water fountain and benches where guests can relax. Olivia Mansion features four exquisitely appointed guest rooms and two luxury suites, all of which are decorated in a rich cottage style with plush décor and antique furnishings. Guest rooms and suites have king or queen-size pillowtop mattresses beds dressed in refined linens and hypoallergenic pillows, and en-suite or private bathrooms with bath/shower combinations, fluffy towels, and monogrammed bathrobes, and designer toiletries. Lodgings have antique dressers, spacious sitting areas with armchairs and modern amenities such as flat-screen televisions with cable channels, and complimentary wireless Internet. Once the first nursery of the mansion, Abelina’s Room is located on the first floor of the house and boasts breathtaking views over the garden from a private balcony. The room has a king-size antique bed with a pillowtop mattress, dressed in refined linens and hypoallergenic pillows, and a private bathroom with a bath/shower combination, fluffy towels, and monogrammed bathrobes, and designer toiletries. In-room conveniences include a flat-screen television and complimentary wireless Internet. Madeline’s Room features an antique queen-size four-poster bed with a pillowtop mattress, dressed in luxury linens and hypoallergenic pillows, and a private bathroom with a walk-in shower, fluffy towels and monogrammed bathrobes, and designer toiletries. In-room conveniences include a flat-screen television and complimentary wireless Internet. The unique feature of this lovely room is the historic brick wall that was once the original exterior wall of the house before expansion. 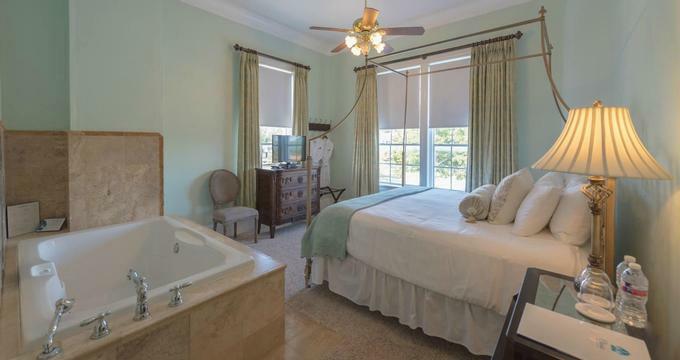 Rebecca’s Room is a charming and quaint oasis with a magnificent king-sized canopy bed dressed in luxe linens and hypoallergenic pillows, beautiful antiques and period furnishings, and a private bathroom with a large luxurious whirlpool tub and a separate walk-in shower. Bath amenities include fluffy towels and monogrammed bathrobes, and designer toiletries and in-room conveniences include a flat-screen television and complimentary wireless Internet. Highlighted by the magnificently restored half-tester queen-size bed rescued after Hurricane Katrina, Katherine’s Room has a private bathroom with a large luxurious whirlpool tub, a separate walk-in shower, fluffy towels and monogrammed bathrobes, and designer toiletries. In-room conveniences include a flat-screen television and complimentary wireless Internet. Once the original master suite of the mansion, Julia Room is a beautiful two-bedroom suite with a king-sized antique bed dressed in clean linens and hypoallergenic pillows, a private detached bathroom across the hall with an antique claw foot tub, fluffy towels, and monogrammed bathrobes, and designer toiletries. The suite has two beautiful dual fireplaces, magnificent original pocket doors, and ornate chandeliers. A complimentary homemade breakfast is served in the mansion’s downstairs parlor every morning and includes freshly brewed coffee, tea and other hot beverages, fruit juices, fresh fruit platters, yogurt, cereals, hot entrées and signature dishes, eggs, and freshly baked bread, muffins, scones and more. Deluxe amenities and guest services at Olivia Mansion include elegant lounges with fireplaces and plush seating and a stunning garden with a water fountain and benches where guests can relax, and a complimentary homemade breakfast served in the parlor every morning. Communal amenities for all guests at the Inn include beautiful gardens, a guest fridge and microwave, coffee/tea facilities, free parking, and complimentary wireless Internet. In-room amenities include air conditioning, ceiling fan or chandeliers, flat-screen televisions with DVD players, fireplaces, hairdryers, irons and ironing boards. Business travelers can make use of the hotel’s conference, and meeting room, which accommodates up to 90 people, and nearby activities include antiquing and auctions, visiting historical sites, taking in live theater and opera performances, or strolling around the historic town. Outdoor lovers can enjoy activities such as hiking, mountain biking, tubing, and sight-seeing. Olivia Mansion provides a wonderfully romantic setting for special celebrations from intimate ceremonies to grand receptions and offers a selection of exclusive event services, including an on-site event coordinator to help with every detail of the function. Venues at the mansion range from the beautiful lawns and oak trees of the Girling Gardens for memorable ceremonies to the opulent Kacey Ballroom for lavish affairs and the Mansion offers several options and packages for elopements.